50 Evangelical Christian Swedes come on first flotilla in support of Israel. After years of flotillas launched from Europe to break Israel's partial blockade of the Hamas-controlled Gaza Strip, a flotilla has been launched in support of the State of Israel. The Swedish ship Elida left last month in a solidarity campaign with Israel, and will arrive in Herzliya this afternoon. 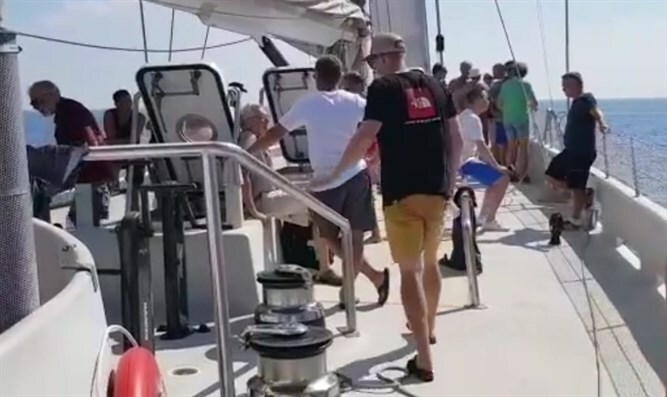 The purpose of the ship's voyage, along with expressing support for Israel, is also to present to the Israelis what the activists call the "other Sweden." There are about fifty evangelical Christians on the ship who are sympathetic to Israel. The vessel will be staying at the Herzliya port in the coming days and will be open to the general public that will be invited to board her and enjoy light refreshments and Swedish music. In addition, the Foreign Ministry will host a delegation from the flotilla to lunch in Jerusalem. The Herzliya Municipality will also hold a special reception for the flotilla activists.